– You will receive a rank up bonus on your content for 100 points. 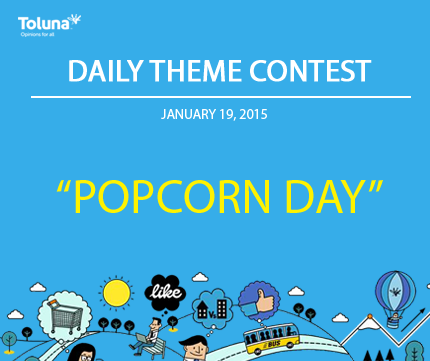 For more information and inspiration regarding “Popcorn Day” click here. *Promotion rules: Limit one content piece created per person. The topic must have the title as given by the Daily Theme Contest post, and must be created within 24 hours of the topic posted. Open to US and Canada only. Members will earn a 100-point rank up bonus. Points will be awarded to winners within 24-48 hours. Posts must not contain any language that is obscene, insulting, threatening, abusive, harassing, defamatory, libelous, untrue, misleading or invasive of someone else’s privacy. Toluna reserves the right to review all posts for content, and withhold bonus points from any user violating the rules mentioned above.